The Salt-Away 32 oz. (Quart) Concentrate can be mixed with up to 128 gallons of water. The mixing unit mixes at a ratio of 512:1. Q. Can Salt-Away be used in concentrated form? 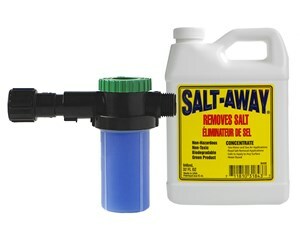 Will that provide better salt removing ability? A. No, Salt-Away is to be mixed. It is not used in concentrated form.